Featuring Caearstone Concetto this kitchen design by Sublime Architectural Interiors has resulted in a unique concept being showcased. Unlike anything else in the country, this kitchen allowed prospective clients to fully experience how today’s technology could enhance their home and their lives. Labelled the “Experience Centre” this stunning showroom is completely controlled via an iPad interface & demonstrates the latest and greatest in integrated technology options to consider for the modern home or office. This multimillion dollar showroom fit out located in Brisbane’s Northside has resulted in a very unique concept being showcased. Unlike anything else in the country, this show room allows the prospective client to fully experience how today’s technology will enhance their home and their lives. Labelled the “Experience Centre” this stunning showroom is completely controlled via an iPad interface & demonstrates the latest and greatest in integrated technology options to consider for the modern home or office. 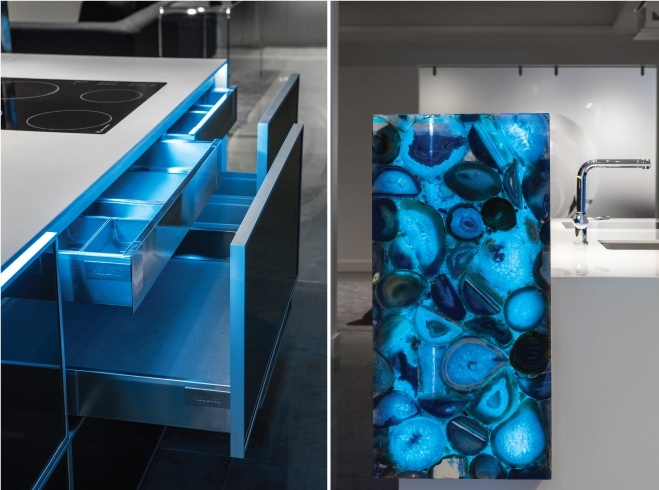 Visually dynamic, this stunning kitchen incorporates an incredible amount of hidden technology. Kim Duffin of Sublime Architectural Interiors knew he was facing a challenge when he received the brief from his clients for this new kitchen space. Future-focused, the owners wanted a space that would be highly functional and cater for their daily needs but also not miss a beat when it came to catering for upwards of 50 guests at any one time. “Automation was also a major consideration when planning this kitchen,” explains Kim. “My clients wanted to incorporate items such as an internet television, lighting and sound systems within the galley-style layout”. The pre determined floor plan and location of services meant a galley style kitchen would be best as it is an integral part of the larger open-plan entertaining space. This configuration assists with traffic flow, allowing guests to easily pass through the space when moving to the reception, lounge and home theatre. Kim’s key design elements make the most of the visual impact of the materials chosen with fittings and fixtures creating mood and ambience. The doors and cabinets have been kept flush for a sleek, streamlined finish while the integrated refrigerator and dishwasher maintains the linear, uncluttered look and feel. When asked if he can pick one favourite item in the kitchen, Kim is quick to answer: “The automated, raised section of the island,” he says. “It has so many uses and can turn the island from day mode to entertaining mode just by bringing it up to its full height. I love how it’s lit – it draws your eye the moment you walk in the front door”.